ART - just do it! 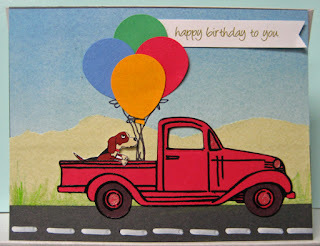 : January Cardmaking - a cute little truck filled with fun!! 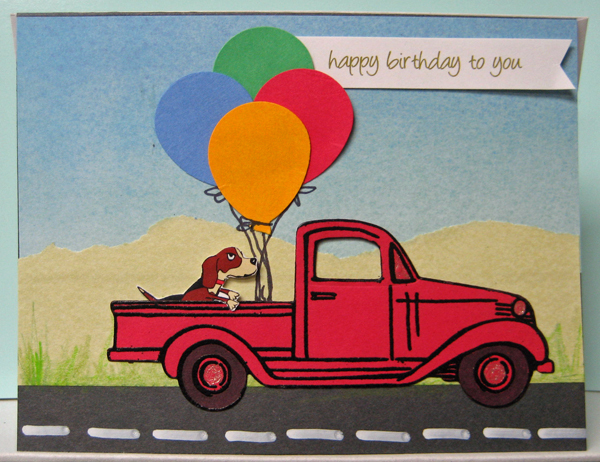 January Cardmaking - a cute little truck filled with fun!! Last time our cardmaking group met one of the girls wanted some Valentine cards for her grandsons that featured trucks filled with hearts!! So I spoke to my sister, Sylvia, who has a little truck stamp and die set and we got together to stamp and cut a few. We stamped in black and embossed in black then die cut them. 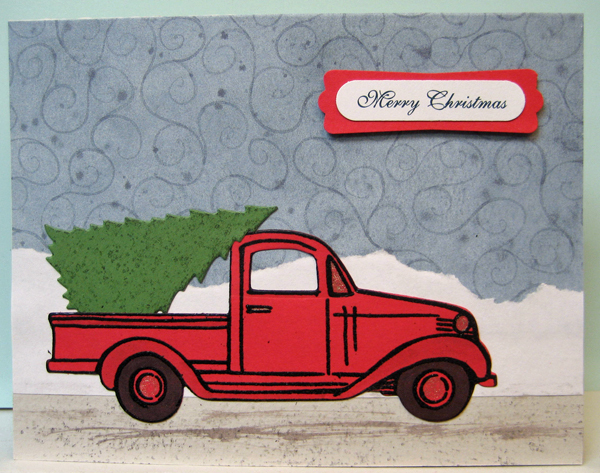 The set includes items you can put in the back like the tree on this first card. I did a bit of research on line to see what others were putting in the back of their pick ups. Hearts, gifts, pumpkins, eggs, dogs, etc so I came up with a few images that would be suitable including backhoes and so on. So for my first card I started with a light gray card and glued on a piece of swirly blue paper to create a sky. I added a torn white strip to simulate a snowbank because I was creating a Christmas card. I added some stippling on the bottom and a bit of brown watercolour to simulate a winter road. I chose a little red truck and coloured in the tires with black marker and the windshield, headlight and hubcaps using a clear glitter pen. I did add a bit of colour to the fenders on the back and front to add a bit of definition and depth. I used double sided tape to adhere it to the front of my card leaving the back without glue so I could add my little tree. 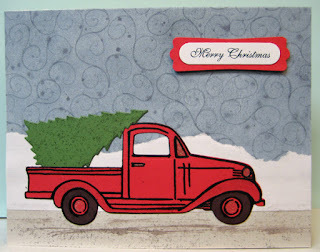 I used the stipple stamp with green ink on the tree before tucking it in the back of the truck. I added a layered greeting - laser printed words punched with the Word Window punch (SU) layered onto a red Modern Label punchie. I added it to my card using 3D foam tape. For my second card, I use a black card front and added a blue paper at the top and then a green torn strip to simulate a tree line. I added green scribbles with three different colour pencils on the bottom edge to simulate grass in the ditch. I used a white gel pen to add a dashed line to simulate pavement. I glued my embellished red truck in place with double sided tape and then went about adding items into the back. I had printed off a little dog so I fussy cut it and then added four balloon punchies adding strings with a fine tip Sharpie marker. I love how it worked out. To finish off my card I added a small laser printed font greeting with a flagged end. I am look forward to adding more fun stuff to the back of the other trucks!! Here are some of the trucks filled with hearts!!!! I have left off the greetings so that they can be customized for the recipients!! The hearts are die cuts in two sizes (CB) which used up a few scraps from my red scrap buckets. I like that the hearts are all different colours!! !